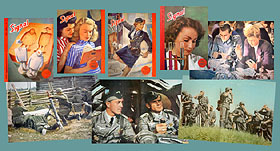 Five magazines, with back covers, shown above at smaller than actual size of approximately 1 1/2" x 2", and 1/16" thick. Four deluxe reproductions that ACTUALLY OPEN in the center to reveal each month's color double-page spread! Stunningly detailed. 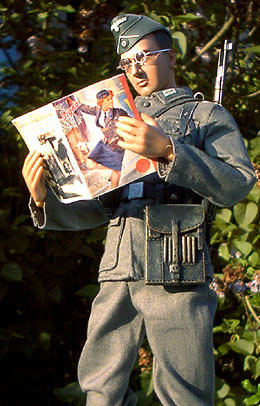 Adler, the German air force's monthly, for your Luftwaffe and Fallschirmjager figures. This set of five featuring the first issue published is shown above at smaller than actual size of approximately 1 1/2" x 2", and 1/16" thick. The images for each set of magazines have been carefully retouched to restore them to their original quality. These high-resolution, miniature reproductions are the finest offered in the market. You may have seen other mini-Signal magazines around, but these roll over them like a King Tiger!